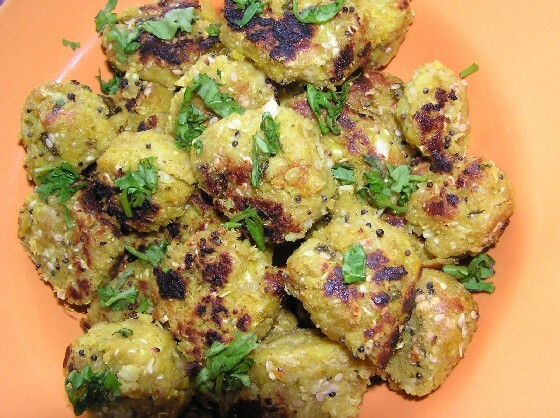 Muthias are a gujju version of vegetable sausage. The name comes from the way it is made - by the ‘muth’ or ‘mutthi’ as in your fist. Its a combination of gram flour and fenugreek leaves with the addition of spices - all mixed together and the wet lumpy mix shaped by your fist with a gripping action. Muthias are usually made of fenugreek leaves - methi na muthia or bottle gourd - doodhi na muthia. Usually mixed with gram flour and spices. Combine bajra flour, wheat flour, gram flour, salt and sugar in a big bowl. Add cumin seed powder, turmeric powder, crushed green chillies, crushed garlic, and crushed ginger. Mix properly and knead lightly. Shape into long thin rolls with your fingers. Steam for half an hour or until cooked. Heat oil, add ajwain seeds and asafoetida. Add muthia and fry until brown. Note: If you are running out of time, you can prepare the muthias in adavance, wrap it in foil and store in refrigerator and use it next day or after 2 -3 days.